Guatemalan ex-President Otto Perez (L) arrives at a hearing at a court in Guatemala City, Sept. 4, 2015. Otto Perez Molina was back in court Friday after spending his first night as an ex-president in military custody. 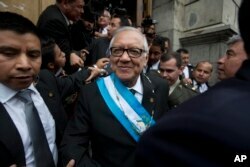 Perez Molina's jailing followed a historic day in which he resigned and Guatemala's Congress swore in Vice President Alejandro Maldonado to serve the remainder of his term. The judge hearing a corruption and fraud investigation against Perez Molina ordered the former president held in custody until the hearing reconvened in the morning. "The first thing I want to deny, I don't belong to 'la linea,''' Perez Molina said Friday, referring to the fraud scheme. Prosecutors on Friday tried to show the judge that Perez Molina did know of the group's activities. Perez Molina had left the court Thursday under heavy police guard and was later seen entering a military barracks in the capital. On Friday, Perez Molina told The Associated Press that he had been uncomfortable overnight and slept little. "No jail is good,'' he said. "I hope the judge gives me an alternative,'' Perez Molina said in reference to being granted bond or house arrest. The court is considering allegations that Perez Molina was involved in a scheme in which businesspeople paid bribes to avoid import duties through Guatemala's customs agency. He is the first Guatemalan president to resign. Perez Molina, 64, has steadfastly maintained his innocence and reiterated his willingness to face the investigation head-on. Uncovered by prosecutors and a U.N. commission known as CICIG, which is investigating criminal networks in the country, the customs corruption scandal involved a scheme known as "La Linea,'' or "The Line.'' It is believed to have defrauded the state of millions of dollars. "The structure under the 1 and 2 received 50 percent, and the 1 and 2 received the other 50 percent'' of the bribes, prosecutor Jose Antonio Morales alleged. Prosecutors contend that in wiretap recordings, 1 was a reference to Perez Molina and former Vice President Roxana Baldetti was 2. Shortly after taking the oath of office Thursday, Maldonado demanded that ministers and top officials submit their resignations so he could form a transition government and promised an honest and inclusive administration. Reaching out to protesters who took to the streets against the country's entrenched corruption, he vowed to leave "a legacy of honesty'' and restore faith in Guatemala's democracy in his brief few months in office. The unprecedented political drama was the climax of a week in which Perez Molina was stripped of his immunity from prosecution, deserted by key members of his Cabinet and saw his jailed former vice president ordered to stand trial - all just days before Sunday's election to choose his successor. A growing protest movement brought together Guatemalans from all walks of life, from business leaders to Roman Catholic Church officials, to demand that Perez Molina step down as the fraud probe expanded to implicate more officials. Baldetti's former personal secretary was named as the alleged ringleader and is a fugitive. Baldetti, who resigned May 8 and is now jailed and facing charges, also maintains her innocence. Analysts said the events of the last few days have dealt a key blow to corruption in the country and boosted the rule of law. "The main factor is the existence of CICIG working with the Guatemalan prosecutor to make the [prosecutor's office] a strong and capable institution,'' said Cynthia Arnson, director of the Latin American Program at the Wilson Center in Washington. "The popular protests were a product of the revelations of the last months, but without an independent body with real capacity to investigate and come up with evidence, we wouldn't see the same kind of scenario unfolding,'' Arnson said. Guatemala's new President Alejandro Maldonado leaves the Congress building after his swearing-in ceremony in Guatemala City, Sept. 3, 2015. Maldonado, a 79-year-old conservative former high court justice, has served as Guatemala's foreign minister and in ambassadorial posts. He also formerly headed Guatemala's highest court where he presided over much-debated decisions like the one not to extradite former dictator Efrain Rios Montt to face genocide, torture and terrorism charges in Spain. He proposed three candidates to replace him as vice president: Raquel Zelaya, president of a conservative think tank and signatory to 1990s peace accords that ended Guatemala's civil war; Juan Alberto Fuentes Soria, a former university provost; and Gabriel Medrano, another academic and ex-Supreme Court president. The shortlist will be sent to Congress on Monday. Maldonado will likely remain in office until the winner of upcoming elections is inaugurated Jan. 14, 2016.